Burkett’s second-generation owner thought she’d stick with a career at Nordstrom. Then life changed. 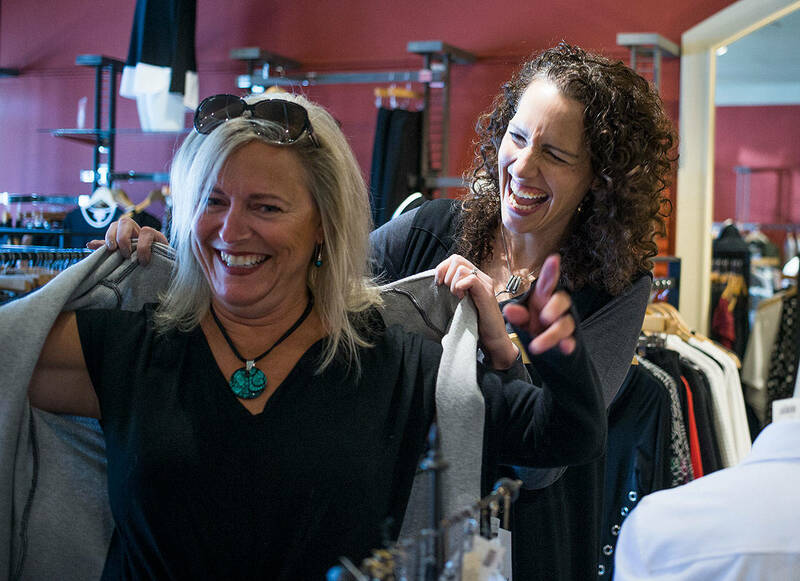 Burkett’s, a women’s clothing boutique at 2617 Colby Ave. in downtown Everett, threw a party last month to celebrate its 40th anniversary — and a special mother-daughter bond. Owner Holly Burkett-Pohland’s tiny office is tucked into a corner of the store. On a shelf above her desk, she’s placed a black-and-white photograph of a stylish, well-dressed woman — the boutique’s former owner and Burkett-Pohland’s mother. “She’s here in spirit,” Burkett-Pohland said of her mother, JoAnn Burkett, now 83. Burkett opened the store on August 17, 1978.
Business ownership among women has increased dramatically in the U.S. since then. It’s jumped from about 500,000 women-owned businesses in the late 1970s to 12.3 million in 2018, according to an American Express study. On average, women launched 1,800 new businesses a day in 2017, the study said. Burkett-Pohland was 10 years old when her mother opened Burkett’s. She would sometimes walk the short distance from Everett High School to visit her mother at the store, but she wasn’t always expected to pitch in. In fact, her first job was at a McDonald’s in Marysville. “My parents never really brought up the store when I was growing up. I was encouraged to go out and make my own way,” said Burkett-Pohland, who graduated from the University of Puget Sound with a bachelor’s degree in communications. By 1995, Burkett was ready to retire and began searching for someone to purchase the business. She asked her daughter if she wanted to buy the store. At that point, Burkett-Pohland, who was climbing the corporate ladder at Nordstrom in Minneapolis-St. Paul, turned her down. “My career was taking off and I really thought I would spend the rest of my career there,” she said. Her mother asked again in 1996. This time, Burkett-Pohland was in a serious relationship with the man she would later marry. Thoughts of home, of starting a family and working for herself made her reconsider her mother’s offer. “I felt if I’m going to work hard, I wanted an opportunity to work for myself,” Burkett-Pohland said. She returned to Everett with her fiance. But stepping into the business wasn’t a snap. Her mother insisted on a 12-month solo trial period. “She really wanted to make sure I wanted to be there.”When the year-long internship ended, they drew up a contract. Stephanie Steinberger, of Everett, was among those who joined Burkett’s 40th anniversary festivities, which included specialty coffee drinks from the boutique’s retail neighbor, Cafe Makario at 2625 Colby Ave., and treats from Simply Sweet Cupcakes in Snohomish. Kirsten Hudson, of Marysville, also popped in to celebrate. “I work in Everett,” Hudson said. “I love coming here. Everything is so nice,” she said, gesturing toward the bright rust-and gray-colored interior and the racks of clothes and accessories. Like others who shop at Burkett’s, or Renee’s, a women’s clothing boutique in business since 1993, at 2820 Colby Ave., Hudson prefers to shop locally. Burkett-Pohland’s daughter, Kate Pohland, a former Everett High School basketball player, was on hand to help with the party. A freshman this year at Seattle Pacific University, Pohland said she hopes one day to work alongside her mother.